Thrilling, heartbreaking, and, at times, absurdly funny, The Last Resort is a remarkable true story about one family in a country under siege and a testament to the love, perseverance, and resilience of the human spirit. Born and raised in Zimbabwe, Douglas Rogers is the son of white farmers living through that country’s long and tense transition from postcolonial rule. He escaped the dull future mapped out for him by his parents for one of adventure and excitement in Europe and the United States. But when Zimbabwe’s president Robert Mugabe launched his violent program to reclaim white-owned land and Rogers’s parents were caught in the cross fire, everything changed. Lyn and Ros, the owners of Drifters–a famous game farm and backpacker lodge in the eastern mountains that was one of the most popular budget resorts in the country–found their home and resort under siege, their friends and neighbors expelled, and their lives in danger. But instead of leaving, as their son pleads with them to do, they haul out a shotgun and decide to stay. 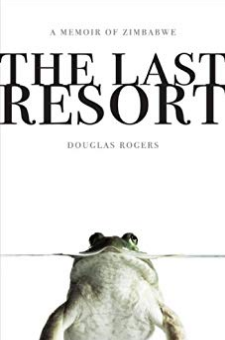 On returning to the country of his birth, Rogers finds his once orderly and progressive home transformed into something resembling a Marx Brothers romp crossed with Heart of Darkness: pot has supplanted maize in the fields; hookers have replaced college kids as guests; and soldiers, spies, and teenage diamond dealers guzzle beer at the bar. And yet, in spite of it all, Rogers’s parents–with the help of friends, farmworkers, lodge guests, and residents–among them black political dissidents and white refugee farmers–continue to hold on. But can they survive to the end? In the midst of a nation stuck between its stubborn past and an impatient future, Rogers soon begins to see his parents in a new light: unbowed, with passions and purpose renewed, even heroic. And, in the process, he learns that the "big story" he had relentlessly pursued his entire adult life as a roving journalist and travel writer was actually happening in his own backyard. Evoking elements of The Tender Bar and Absurdistan, The Last Resort is an inspiring, coming-of-age tale about home, love, hope, responsibility, and redemption. An edgy, roller-coaster adventure, it is also a deeply moving story about how to survive a corrupt Third World dictatorship with a little innovation, humor, bribery, and brothel management.From the Hardcover edition.